How to solve the problem of touring is a question the theatre sector has been grappling with for years. One initiative is looking at that problem from a very specific angle: how do we create more touring opportunities for black, Asian and minority ethnic theatremakers? Now in its third year, Black Theatre Live selects and supports small- and mid-scale shows by BAME-led creative teams to tour to a consortium of eight venues across England, alongside a varied programme of audience engagement. The initiative has been led by Jonathan Kennedy, outgoing executive producer at Tara Arts. He set out with a series of questions: “Is it getting harder to tour? Are venues making more conservative choices in what they programme? And how can we do something that shifts that argument out of the doldrums and moves it on?” In attempting to answer these questions, he embarked on extensive research, speaking to venues and companies across the country. The consortium of theatres that emerged from this research was “by definition eclectic”, comprising venues in both urban and rural areas and with a range of audience demographics. The idea, Kennedy explains, was to enable BAME touring shows to reach “all kinds of audiences, both diverse and non-diverse”. The consortium model also links up audience development initiatives and enables wider conversations. “What we have relished as an organisation is the opportunity to connect across the other theatres within the network,” says Karen Simpson, director of consortium member Theatre Royal Bury St Edmunds. She adds that, as a theatre that is not part of the Arts Council’s national portfolio, the Theatre Royal has benefited hugely from being part of a broader, shared endeavour. Theatremakers, meanwhile, have the advantage of additional touring and audience engagement support, as well as the opportunity to network with programmers during a face-to-face selection process. When selecting work for the tours, Kennedy explains that decisions have always been made “on the strength of the idea”. The members of the consortium also consider “where we think it will reach by way of our audience development and what kind of audiences we feel that it would be suitable for or exciting for”. The 2017 tour, Big Foot, is an autobiographical play by Joseph Barnes-Phillips, narrating his experience of growing up in south London as a young black man. The show is produced by theatre company HighRise, which puts on work rooted in London youth culture but is keen to take that culture out to a wider audience – something that Black Theatre Live facilitates. “It’s a really big step for us,” says director Dominic Garfield. 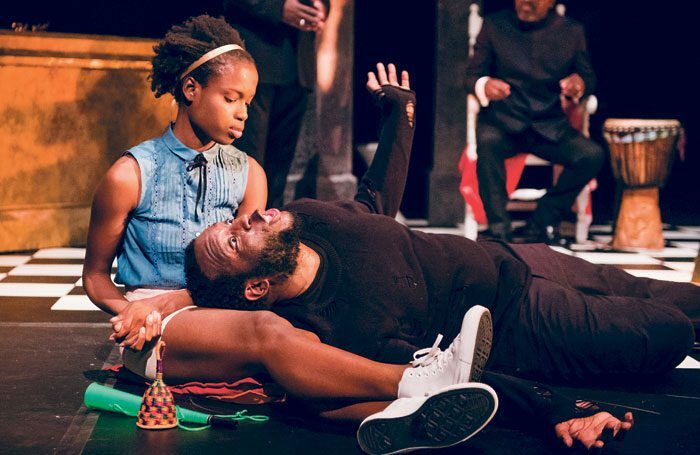 “Moving to different venues across the country is going to be a really interesting and exciting and difficult thing.” Alongside the show, HighRise is working with Black Theatre Live on an audience engagement and facilitation programme, to introduce audiences to the south London world they are putting on stage. Garfield explains: “We want to make sure we’re putting a proper footprint in the communities that we’re in, as opposed to just coming, doing the show and leaving”. 1. The consortium is made up of Tara Arts, Stratford Circus, Queen’s Hall in Hexham, Derby Theatre, Theatre Royal Bury St Edmunds, Theatre Royal Margate, the Key Theatre in Peterborough and the Lighthouse arts centre in Poole. 2. Each call-out for small-scale touring shows has received between 60 and 70 proposals, demonstrating what Jonathan Kennedy describes as “an absolute thirst for smaller BAME companies to tour”. 3. It has toured a mixture of new and classic work, ranging from Inua Ellams’ one-man show An Evening With an Immigrant to the UK’s first all-black production of Hamlet. 4. Since the programme began, a further 30 venues have programmed the work that has been selected and commissioned by Black Theatre Live, while Ambreen Razia’s 2016 show The Diary of a Hounslow Girl has been remounted in partnership with touring consortium House. 5. It is funded through Arts Council England’s Strategic Touring Fund, which aims to increase audience engagement and diversity through the support of high-quality touring work. Approaches to audience engagement have varied across the consortium. Kennedy says: “There is no ‘one case fits all’ for the venues, because they are so very different.” In Bury St Edmunds, for example, Simpson and her team took the opportunity to get creative when involving local communities. During the 2015 tour of She Called Me Mother, the Theatre Royal used the content of the play, which addressed homelessness and the break-up of family, as a starting point for building relationships with the local YMCA and women’s refuge. But what have these efforts achieved? In terms of audience numbers, Black Theatre Live’s small-scale tours are outperforming the national average by 10%, while its mid-scale tours have achieved a more modest 4% improvement. Kennedy admits that “the big challenge remains on the mid-scale”, though this is true across the whole sector. The consortium’s live-streaming programme has also allowed thousands more people to see Black Theatre Live’s tours. While he is clear that “it’s a different experience from being in the theatre”, Kennedy hopes that the integration of social media and the opportunity for online viewers to ask questions of the shows’ creative teams has created “a richer sense of engagement for those audiences, wherever they are”. Now, as the three years of the programme draw towards a close, Kennedy is looking to the future. The question he is asking himself is: “Have we started something rather than started and finished something?” Heartened by audience responses so far, he hopes funding can be secured for the consortium’s work to continue. Even if that’s not possible, the ambition is that the programme will have a wider, lasting impact across the sector. Part of the legacy of Black Theatre Live lies in its evaluation and sharing of knowledge. The consortium has been working with the Audience Agency, whose Audience Finder analysis tool has allowed individual venues to assess its demographic reach. As Kennedy explains: “We can really build a picture of how far we are getting with the tours and whether we’re achieving what we set out to do by way of diversifying audiences.” Their findings, together with research developed in partnership with King’s College London, are all freely available on the project’s website, opening up the lessons that have been learned to a wider industry audience.